-redrawing and recoloring every page of the comic for the print version!! literally every single page. This took a very long time, and was worth it. -finalizing and ordering literally thousands of Meek reward items for KS backers… so much STUFF. -other boring logistical stuff that takes time to do. So yeah, that’s where I’ve been… it is really important to me to make sure this book is as beautiful as possible so I decided to put the time in and really polish it the best I could. Hopefully all backers have picked up the Volume 1 wallpaper set already! If not, check out this post with info on how to redeem yours :] The PDF copies of the book will be going out this month, I am just running it past a lot of people first to make sure it (and the print pages) are completely perfect. If you missed the campaign, I will likely be opening up limited preorders, will post here on that when it happens. In other news, I finally set up email notifications! If you don’t like RSS or the unreliability of social media notifications, you can now get updates sent straight to your inbox. Last, I’ve been still hard at work on other stuff… there’s a giveaway contest running both on Mare Internum and on the Patreon if you’re a MI reader! I’ll be doing giveaways more frequently now that I’m a Real Capitalist, will probably have some Kickstarter swag up for grabs in the upcoming months. The September tutorial was also pretty popular in case you missed it, and there are two whole supplements unlocked this month as well to sweeten the deal. Anyways, sorry that’s a lot of info XD Basically I’ve been staring at Meek stuff for the past month straight and you haven’t, but I am slowly sliding back on track with everything, so see you next week with the next page! Hmm, what are the red things? Sources, or it didn’t happen! Whoaa. Every single page of CH 1-3? Or “only” those from before the break? These are already amazing! 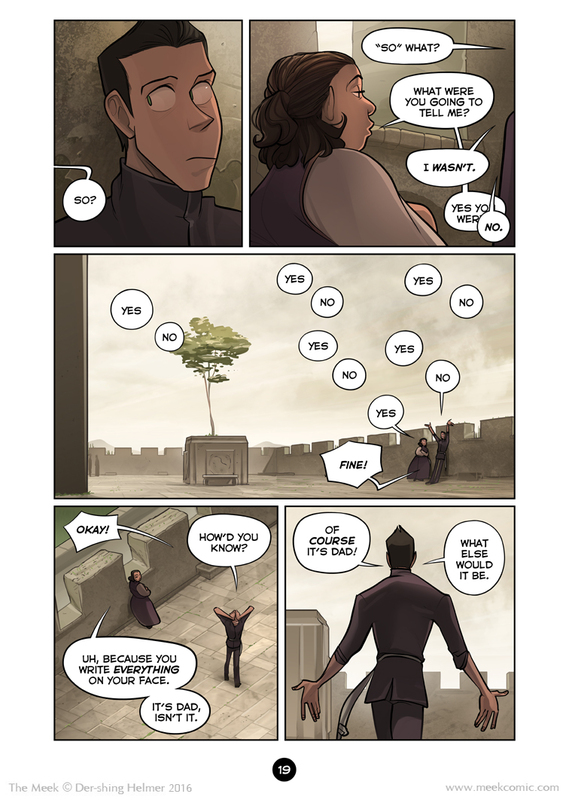 Yeah, all 139 or whatever pages, redid a bunch of art and added color holds to everything… Looks SO much better now! And was a relief to finally render some lighting the way I’d always intended. I keep thinking I should sign up for the notifications, but I like keeping the Meek and Mare websites pinned open in Chrome and I would feel naked without them. Loving the tree against the grey sky in panel three, and I really hope I’ll be able to get the book! The lack of good food on the mission would be an alternative. Yup, I read all my comics exclusively by RSS too. Although I have to say the feed on this site is seriously well hidden – unless you stumble on the single link or guess the URL you’ll never know it’s there. Oh, really XC dang, haha. I have it in the links bar but maybe it’s not clear enough… I’m doing a little facelift soon and will make it more obvious! Ooop, Suda’sback to his :/ face. Time to talk about Dad issues! Der-Shing, I wanted to thank you for sharing O Human Star in the last update. It’s so good – I can’t stop reading it! Isn’t it though!! All my favorite comics I list on both comic’s link pages :] Defs support the KS if you can, the books are beautiful as well. Just the five minutes please! 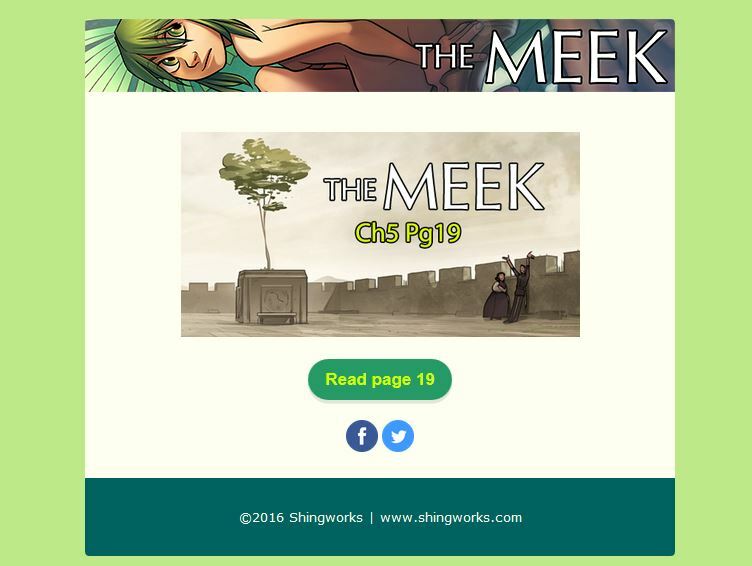 Took me a moment to remember where we were at storywise, Its been awhile since the last page, glad to see the Meek back on my RSS feed. Got a problem with the wallpaper page, I click “I want this!” and nothing, ad-block is off and it’s not blacklisted in my script blocker, does anyone know whats up with it? I’ll check it out? It’s a gumroad site, not really under my control, so it might be an issue on your end. I’ll take a look though.